Flora isn’t a terrifying name for an asteroid, but that isn’t stopping this one from threatening Earth. Enter Commander Jack Rankin (Robrot Horton) and Commander Vince Elliot (Richard Jaeckel) who manage to stop bickering over Dr. Lisa Benson (Luciana Paluzzi) long enough to fly over to the asteroid and blow it up. Sadly for them, someone brings back a hitchhiker to their space station, Gamma One. The asteroid contained pools of a strange green slime that, once in the presence of radiation, mutates into one-eye monsters with flailing electric tipped tentacles. Cue the music! Let us just get this out of the way; the best and most memorable thing about The Green Slime is its theme song. It is funky and catchy; it will haunt you for the rest of your life. You will sing it while driving; you will sing it in the shower, it will loop endlessly in your head while you are trying to write a movie review. Please enjoy it in all its glory. "Commander, I'm just going to come out and say it: This is space poop. We are standing on space poop." As for the film itself, it doesn’t quite live up to the goofy joy of the theme song. The movie takes itself far too seriously. I am all for a film taking an outlandish premise and playing it straightforward, but that doesn’t mean there is room to have fun. 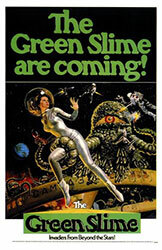 The Green Slime plays out its premise with a grim determination that is more fitting for a moody film like Alien (1979), rather than a brightly colored space adventure. The second crime this film commits is not getting to the aliens quickly enough, it would rather spend far too long on the posturing of its two leading men. This might be an attempt to give the characters some depth, but they are both jerks, so who cares? Bring on the self-replicating monsters that electrocute people. The one upside of this seriousness is that once the creatures do manage to swarm all over Gamma One, there is a feeling of actual threat to the characters. The fact that it comes from floppy-armed rubber monsters creates the core of absurd enjoyment that keeps the film from being a total slog. The little cyclopoid monsters are more cute than menacing, but they do managed to deliver some gruesome deaths to any crew members unfortunate enough to wander into tentacle range. The green horrors make the cutest sounds too. "That better be a laser gun digging into my hip, mister.". For a Japanese production, the miniatures and models are, at best, passable. They lack attention to detail. The whole film is shot in a flat workman-like manner that limits the dramatic tension. I do rather like the psychedelic look of the slime infested asteroid. The whole movie would have benefited from more outlandish visuals, but our stay on Flora is short lived, and the movie returns to the dull gray confines of Gamma One for the remainder of the story. The premise, the music, the monsters, all these elements could have come together to create something memorable, and indeed all these individual elements are fun, but they never congeal.